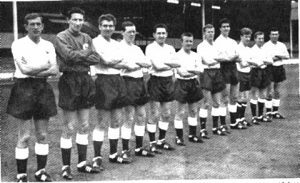 This page is devoted to the night Spurs last won the Football League – as it was then, on Monday April 17th 1961. The opposition was Sheffield Wednesday who were the first team that season to beat Spurs 2 -1 on Saturday November 12th 1960. The team went on to win the FA Cup Final at Wembley and become the first club to win the Double since Aston Villa in 1896-1897. Danny Blanchflower (capt), Bill Brown, Ron Henry, Les Allen, Dave Mackay, Terry Dyson, Peter Baker, Maurice Norman, John White, Cliff Jones, Bobby Smith. See Team page for photos and biographies of team, management and reserves. This is how the Spurs team of 1960/61 usually lined up. The 2-3-5 formation and positions may seem strange to the modern football fan. By the end of the 1962 season this had been totally overtaken by the more conventional 4-4-2 and with it the decline of the orthodox winger. Les Allen (out of frame) scores the winning goal that clinches the title. Bobby Smith is in the foreground. 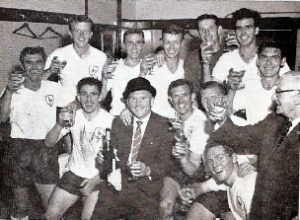 Celebrations in the dressing room for winning the opening ten matches – a League record. Bill Nicholson is sitting in the centre of the bottom row. In 1961 they bought Jimmy Greaves. Les Allen knew it would be him that would have to make way. Greaves could only add to any team for who he played . Now in 2015 he is now suffering from ill health so to remind everyone of his genius here is a YouTube clip from Spurs vs Manchester United on 16 October 1965. 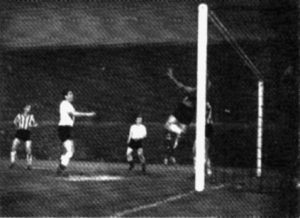 Kenneth Wolstenholme called it the goal of the season. It could be the goal of any season. Enjoy. I have posted a short (30 second) video on You Tube showing the 1961 FA Cup Final vs Leicester. It is in colour and although short, does show the two goals going in from Bobby Smith and Terry Dyson. My personal memories of White Hart Lane now that Spurs will be using Wembley for 2017 – 2018 season and the new stadium is possibly going to be re-named. The complete fixture list from season 1960/61.